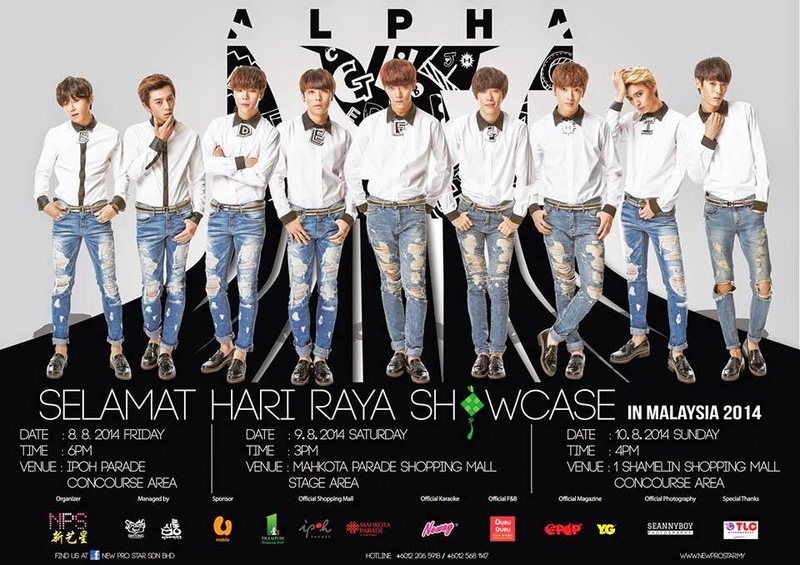 AlphaBAT Returned with 3 Days of Hari Raya Showcase Tour! AlphaBAT has recently visited our shore once again for a showcase tour during the Raya festive season! Kicked off from 8th to 10th August 2014, the group that consists of 9 handsome lads performed at 3 cities; Ipoh, Melaka and Kuala Lumpur.AlphaBAT has received overwhelmed attention from local as well as fans from neighbor countries through their previous visit. A few fans were seen at Ipoh Parade, Perak as early as 9AM to catch the boys practicing on the stage before the actual showcase started at 6PM. We received a news earlier that one of the member, E:psilon had a leg injury thus he couldn’t do any dance performance for the time being. Kicked off with a cover performance of Big Bang’s ‘Tonight and a performance by B:eta, D:eltaand I:ota of their own rendition of SISTAR’s “Loving You”, the stage continued to heat up with a performance of a rap/cypher, “삼박자 (sam-bak-ja)” by I;ota, F:ie and J:eta. A small interview was conducted, followed by performances of“AB City” and “딴따라(Ttantara)”. Fans even surprised birthday boy, E:psilon with a cake on stage! He then joined rest of the members for “Always” before thephoto session and autograph session starts to wrap up the day. The next showcase was held at Mahkota Parade, Melaka the following day with the same show rundown except that this time it featured a game session with lucky fans who bought their albums and limited edition merchandise on the spot. The showcase was witnessed by audience whom filled up each floor level! It was amusing to see the crowd who stayed to catch the performance right before their eyes especially for a rookie idol group! AlphaBAT even surprised the Malaysian Alphas (what AlphaBAT’s fans are called as) as they mentioned that they filmed a music video here for their upcoming release! Leader, B:eta asked fans to expect for their new music release on 22nd August 2014. When was asked what Malaysia means to each member, they gave out different answers. F:ie caught our attention the most as he answered with “Malaysia is my girlfriend” which received loud cheers from the fans! The showcased then wrapped up with a photo session and autograph session. The final showcase was held at 1Shamelin Shopping Mall, Kuala Lumpur with the same show rundown. We were impressed with the loud fanchants from fans as AlphaBAT performed “AB City” and “딴따라(Ttantara)”! Fans even presented police batons for the lads’ performance of “딴따라(Ttantara)”. The showcase then wrapped up with a photo session and autograph session. A celebration party for only 150 fans was also held later at night at Summit Hotel, Subang USJ. KLOSEUP would like to thank New Pro Star Sdn. Bhd. for their endless invitation to mesmerizing events.